Not too long ago was it commonplace for many a freelancer or startup entrepreneur to meet and discuss ideas over coffee in public cafes or restaurants. But is now the 21st century, and the rapid growth of the Internet has elevated the larger workforce into the online space, giving way to the rise of flexible working situations — indeed, gone are the days of swivel-chaired office desks, and in the proliferation of start-ups and freelancers in recent years, a new kind of innovation was born: that of the co-working space. Acceler8’s Paseo Coworking Space offers a venue for all freelance, start-up, entrepreneural needs – and more. 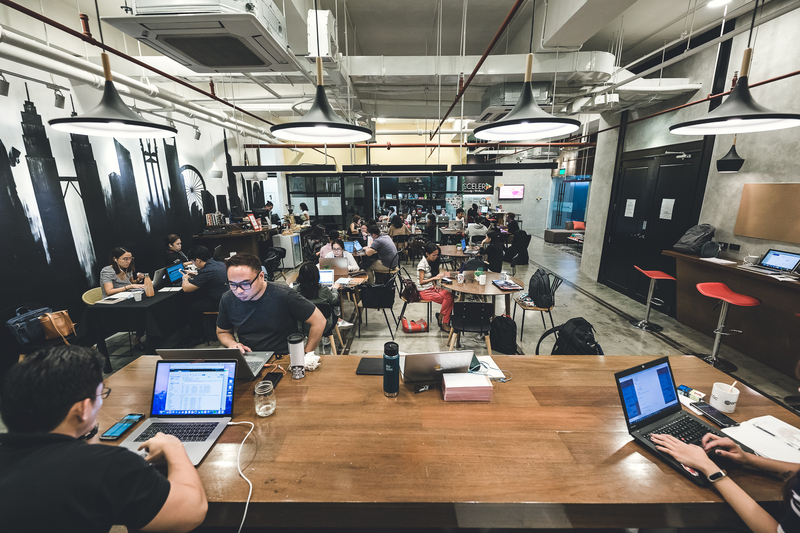 Although perhaps a relatively novel term for some, particularly of the older generation, the coworking space has since been part and parcel of the millennial workforce, particularly for the rising freelance and startup demographic in the Philippines. 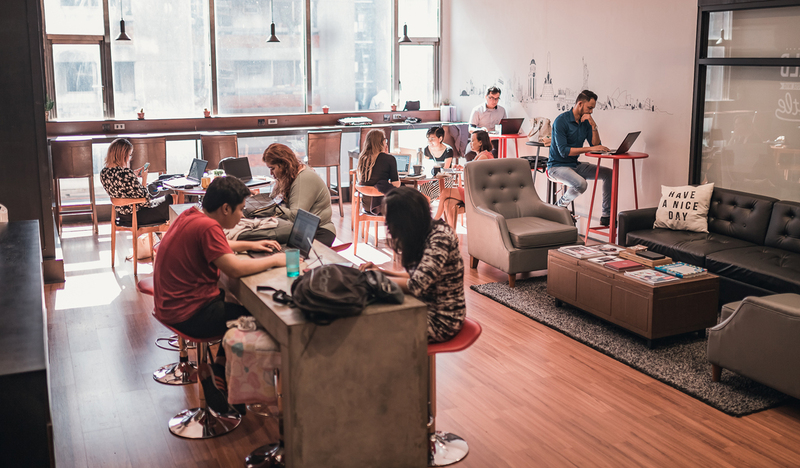 And indeed, with most boasting free-flowing drinks and collaborative ambience, the coworking space strikes the balance of laid-back and professional, capturing the serenity and casualness of cafes with the sharp professionalism of the typical modern office. And at the very center of it all is UnionSPACE’s Acceler8, currently holding two spaces in Makati — one in Legaspi Village, and another in Salcedo. Since opening their first branch in Salcedo Village, Acceler8’s community has grown, with their newest venture launching this December. 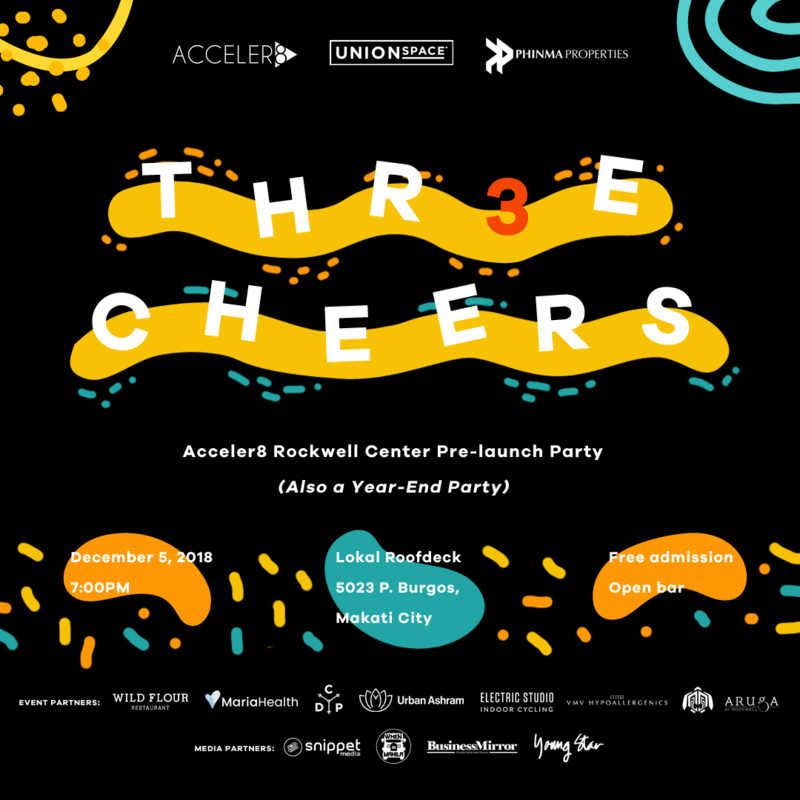 In the three years since its inception by founders Mikko Barranda, Carlo Coronel, Bryant Cuison and Albert Goh, Acceler8 has expanded to include multitudes in its community of two offices, and is set to continue even further with the launching of a third space in the city’s Rockwell district, located in the fifth floor of PHINMA plaza — one of the most revered buildings in the neighborhood. The company’s new venture will combine a total of 24 serviced office suites, three meeting rooms, and an expansive office space to cater to any collaborative working need. And all this comes to the public at the end of this year, on December 5th, in a pre-launch-slash-year-end party at the very venue itself, where the public will be given a special in-depth preview of the newest space, along with raffle and networking activities, and, of course, free-flowing drinks from an open bar. The party, dubbed Three Cheers! will take place at the rooftop of the Lokal Hostel Roofdeck in Poblacion from 6pm onwards on Wednesday, December 5 and is open to the public. The event is presented by WildFlour, CDP Global Table, Tortuga, Maria Health, Urban Ashram, Electric Studio, Aruga by Rockwell, VMV Hypoallergenics along with media partners SnippetMEdia, WhenInManila.com, Young Star, and Business Mirror. In the name of brotherhood: Should schools ban and enforce stricter sanctions against fraternities?